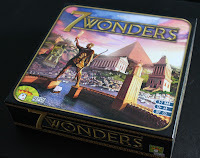 7 Wonders is a civilization building card game, where you are responsible for the development of a city that houses a "Wonder" throughout the ages. The game itself came out in late 2010, and almost immediately sold out at the publisher due to its popularity. As of April 2011, the 2nd printing of the game is just now starting to hit store shelves. If you were not able to find a copy of the game locally when it almost immediately came out, you were subjected to having to go online and find it for almost twice its suggested price. 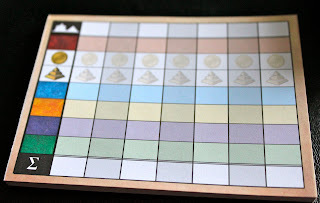 Within the box, you will find seven 2-sided Wonder boards and a lot of cards split into three decks, each representing a different age of play, and coins used for money. 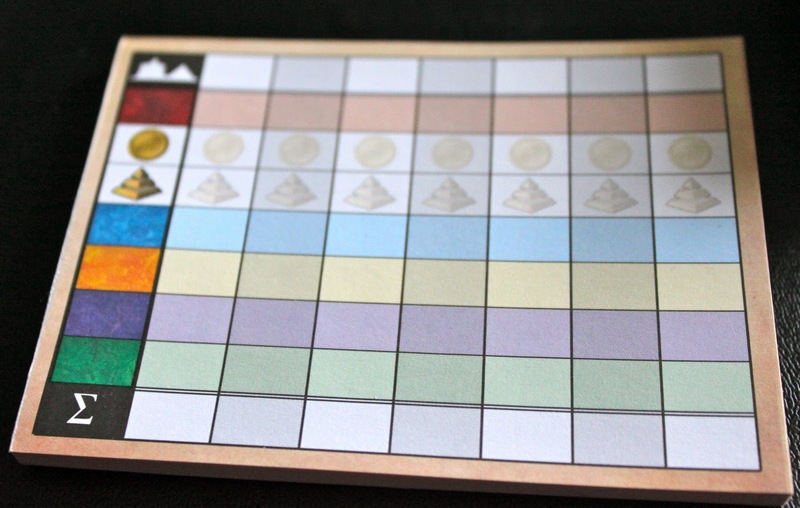 The first printing of the game includes wooden coins, but beginning with the second printing, the game will include paper-punch coins. 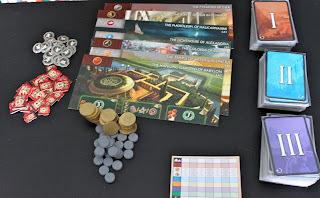 The game is played over three rounds called ages, where what you do or build in the early ages make a difference as to what you can do later on. To begin, everyone will randomly receive a Wonder board, which features your starting resources and the benefits from building up your cities Wonder, and is dealt a hand of seven cards. 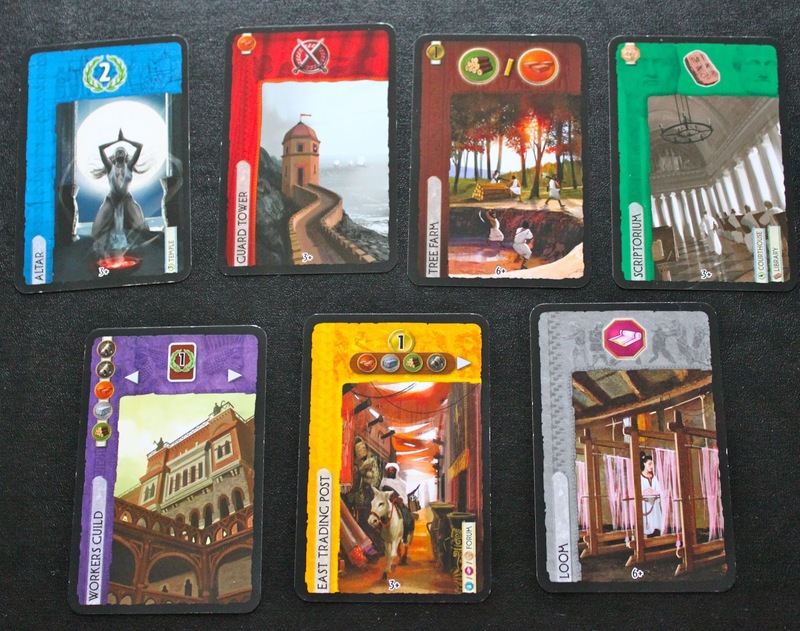 From these cards, the player must pick a single card to be played simultaneously with everyone else. 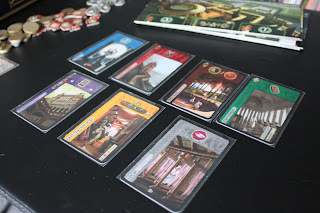 Players reveal their cards at the same time, resolving any actions as needed, followed by handing their remaining cards to the person next to them. When players get down to two cards left in their hand, they discard the last one. Military battles are resolved, players are dealt a new hand from the next age, and do it again. And thats it really, a fairly straightforward easy to understand game. But its in what and when you play that matters. The game has 7 different types of cards that each have their own rewards for playing. Some allow for the resources to build their empire, others give military might to defend it. Some will allow for better commerce both within their city and with their neighbors, while others will create cultural benefits to the people. And the Science (the SCIENCE!). Depending what you play early on will directly impact what you can play later. Most cards have a cost associated with them (found in the upper left corner), usually resources, sometimes money. If you have the resources in your city, then you can build them. But if you don't, you can always buy them from your neighbors, assuming they have them. In later ages, some cards can be built for free, assuming you played the right cards early on. Imagine the excitement of building your Wonder! 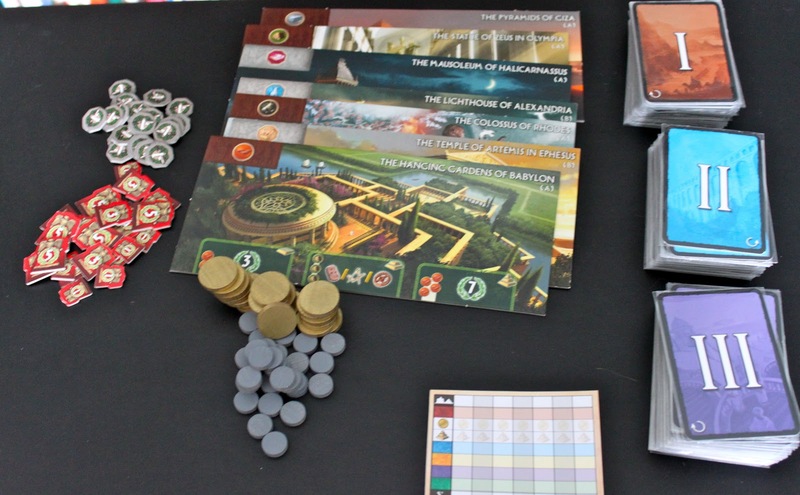 It becomes an intricate balancing act as you play, as you need to decide early on how to best build your city. Should you build this ore mine to increase your resources, or play this other card and increase your science? If you focus too much on a particular type of card, then you may get dominated later by another. But if you diversify too much, then you may not be able to afford some of the bigger cards late in the third age. Throughout all of this, you are also trying to build your wonder. By completing a stage to your Wonder, it will give you unique benefits that only you have access to - sometimes money, sometimes resources, sometimes victory points. You may find yourself in a position where you can not do anything with the cards in your hand, to which you can discard and get more money. By the end of the game, everyone has built an impressive empire across the table, but who has won? It's very difficult to gage how any one person is doing overall during play, due to the the game being scored simultaneously in seven different categories. With everyone having different starting resources, it means there is no one proven strategy that will work for everyone. 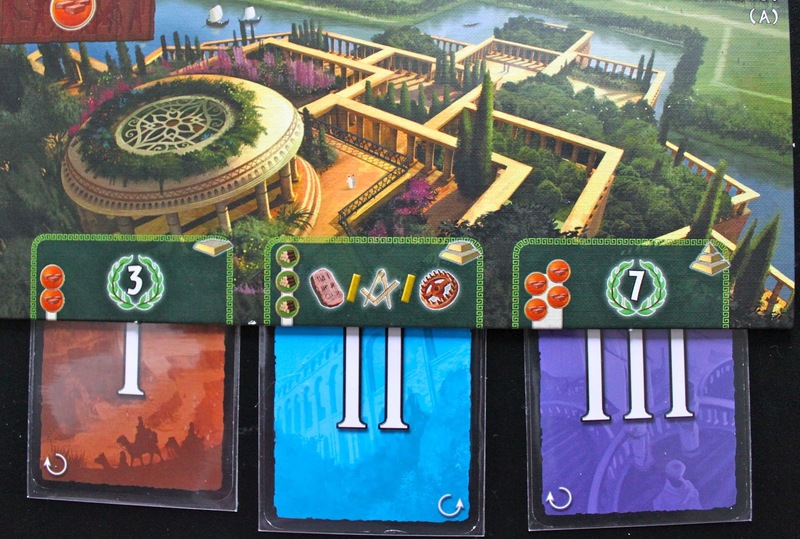 Points are scored on how well you did in military, civics, finances, commerce, science, the building of your wonder, and what different guilds you have in your city. each are scored uniquely, some from just adding up the points that are on the cards to others requiring the use of multiplication tables. Its only real setback to the game is that the cards are amazingly cheap, and can easily get damaged. After playing for the first time, the cards in my set started to show wear almost immediately, so sleeving the cards is not a bad idea (as ridiculous as that sounds). The cards themselves are also oversized, so standard sleeves will not fit. In fact, the only place that I know of that you can get sleeves for the game is through Mayday Games. The game is fantastic, and plays amazingly well. It accommodates for 3-7 players, and can be done in 30 minutes time, easily allowing for several plays over the course of an evening. The hardest part to the game is initially learning what all the different cards do only because there are so many. Once you get playing though, its very fluid. 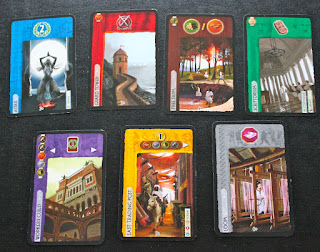 The artwork on the cards is fantastic, and the large variety of strategies that can be played are impressive. After every time that we have played, it has left us talking about our approaches to victory for quite a while afterwards. This is one I have been seriously considering. Our most recent game purchase is London, and that's become Jess' favourite game (And I like it a lot) so she's open to card games. I am kind of tossing up between this one and Innovation. 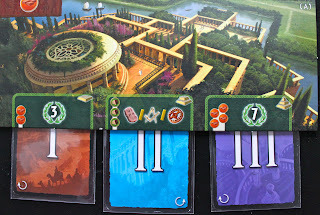 While both fill a civ building game in card form, 7 Wonders is a lot faster and easy to play, where Innovation is overly complex with some confusing rulesets. Not saying its bad, but it could be more streamlined. 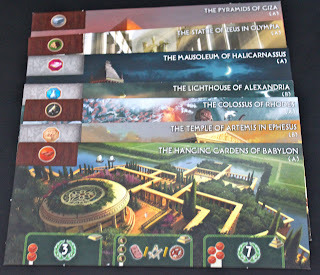 Also, Innovation is priced at what 7 Wonders should be, but I would still choose 7 Wonders over Innovation if given the choice because it is a much smoother game to get new players into. Plus the cards are much prettier. My thought though, is that Innovation might be deeper and have a longer shelf-life? You will amazed to know cool math games frizzle fraz is a well known game online. This game i think is from the seriews of coolmathgames. Few games are based on cartoon characters and Pbs Kids Games for Kids is also one of them. run 2 is a running game. While searching for 2048 game play it online. YOu can play these games by going here. Good luck with your presentation! I'm sure you will do fabulous! Love your plans and thanks for reminding me the TPT sale is upcoming! I only have like 150 items on my wish list to pick through lol! Read More..
Go here to play free friv for school, friv 4 school, friv4school and more internet games. They guarantee that this site contains just safe games for children and you can enjoy likewise Educational and learning games on the web. Useres from everywhere throughout the world come to play web based games. So in the event that you are searching for the games for your children which are material science based and for learning you can try this for nothing.